After the recent post of favourite fighting games I decided I'd post one of my favourite fighting games of the 1980's - International Karate + In the US the game was titled Chop N' Drop. The game is the sequel to International Karate and was released in 1987 on 8-bit machines The Commodore 64, Amstrad CPC, and ZX Spectrum, and a year later for their 16-bit big brothers The Commodore Amiga and Atari ST. Unlike the first game it only has one backdrop, but now features three fighters instead of just two. The game on the 8-bit versions looked nice. But the Commodore Amiga version was the best by far! Look out for spiders, a submarine periscope and even Pac Man. The Amiga port was reportedly done in just seven days! It also featured a new bonus round in addition to the bouncing balls. You could also change the speed of the game, playing on swift makes it much more challenging. Eventually is was also ported to the Commodore Amiga CD32, the Sony Playstation and Nintendo Gameboy Advance, as well as being released recently on virtual console. 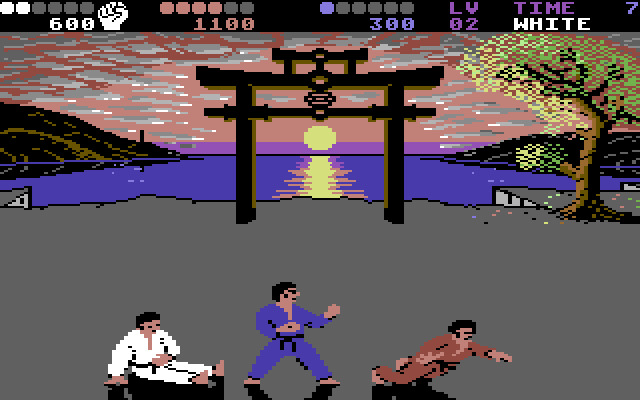 There are plenty of moves, including headbutts and jumping splits, and can be played 2 player, with the third fighter always being controlled by the computer. The bouncing balls bonus rounds are great fun! Check them out in the gameplay videos. Overall I give this game a 7/10, it's just plain old style fun and stands the test of time well, it's still as playable today as it ever was. Gotta love how much better it looks on Amiga. Oh, is that Pac-Man in the background? Heh yeah. Me and my bro used to watch the background and forget to concentrate on the game. Mingle Forum by Cartpauj | Version: 1.1.0beta | Page loaded in: 0.086 seconds.